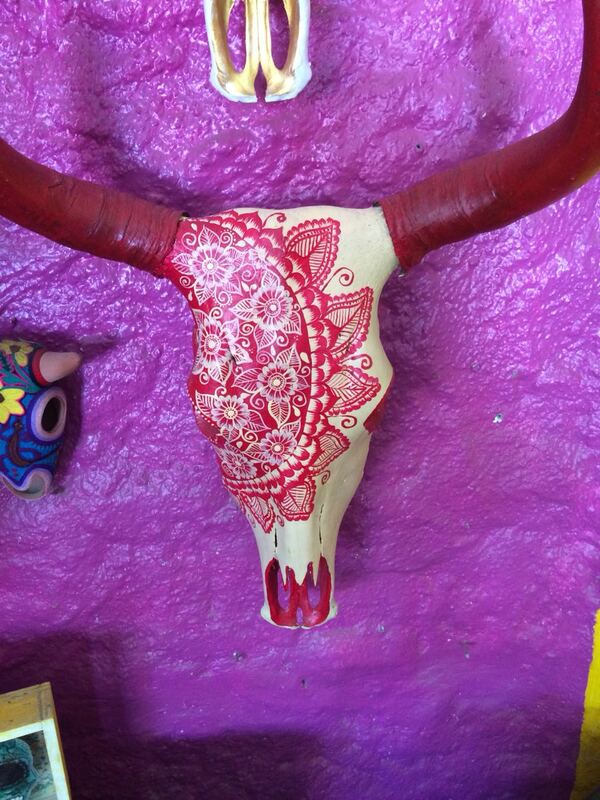 I bought this traditionally painted cow skull, a typical decoration item for the day of the dead. Since its bone (completely clean though) can I bring it with me on a plane as carry-on or special luggage, without having to declare it or having it confiscated? Even if it is totally okay for you to bring, you must always declare all agricultural products that you bring to the US. If you do not declare it, it could be confiscated even if it otherwise would have been allowed. You could also be fined. Many fresh, dried, and some canned meats and meat byproducts are prohibited entry into the United States from foreign countries because of the continuing threat of foot-and-mouth disease (FMD), bovine spongiform encephalopathy (BSE, or mad cow disease), and other animal diseases. If meat from restricted countries is included as an ingredient in a product (e.g., beef broth), the product is usually prohibited. Because regulations concerning meat and meat byproducts change frequently, travelers should contact the consulate or local agricultural office in the country of origin for up-to-date information on the disease status of that country. Animal hunting trophies, game animal carcasses, and hides are severely restricted. To find out specifics and how to arrange to bring them into the United States, contact USDA/APHIS Veterinary Services, National Center for Import and Export (NCIE) at (301) 851-3300, via email at: AskNCIE.Products@aphis.usda.gov or VS-Live.Animals_Import.Permits@aphis.usda.gov or on the Web at Veterinary Services - Safeguarding Animal Health (Import/Export). The import and export of wild (and endangered) animals is regulated by the U.S. Department of the Interior, Fish and Wildlife Service (FWS). For a list of endangered species check the following: http://www.cites.org. A painted skull is not meat or a meat byproduct, so the first two paragraphs do not apply. It is also not a hunting trophy, and I don't think it qualifies as a carcass. It is certainly not a hide. It is not a wild or endangered animal. But that paragraph helpfully refers you to an office were you can ask for specific guidance. I think they refrain from listing bone products specifically because the evaluation of a bone product depends on its state (how much meat is attached, for example), and is probably somewhat subjective. ...fully finished manufactured products made with bones or horns. Examples include, but are not limited to, ..., and souvenirs. These products are unrestricted. The question then is whether this skull is "fully finished" and "manufactured." In conclusion, your best chance of not having it confiscated is to clear it with the USDA or CBP first. Not the answer you're looking for? Browse other questions tagged usa air-travel hand-luggage souvenirs or ask your own question. Can I bring a decorative clay adorned goat skull to the US from Guatemala?